So, you survived the first semester of Organic Chemistry (maybe even by the skin of your teeth) and now it's time to get back to the classroom and lab! 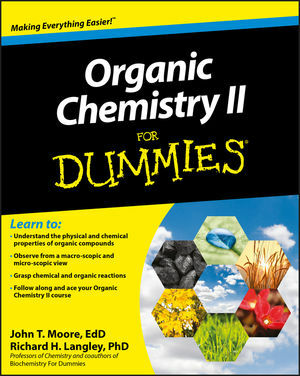 Organic Chemistry II For Dummies is an easy-to-understand reference to this often challenging subject. Thanks to this book, you'll get friendly and comprehensible guidance on everything you can expect to encounter in your Organic Chemistry II course. Whether you're confused by composites, baffled by biomolecules, or anything in between, Organic Chemistry II For Dummies gives you the help you need — in plain English! John T. Moore, EdD, is Regents Professor of Chemistry at Stephen F. Austin State University in Nacogdoches, Texas. He is the author of Chemistry For Dummies. Richard H. Langley, PhD, teaches chemistry at Stephen F. Austin State University. Langley and Moore are coauthors of Biochemistry For Dummies. Part I: Brushing Up on Important Organic Chemistry I Concepts. Chapter 1: Organic Chemistry II: Here We Go Again! Chapter 2: Remembering How We Do It: Mechanisms. Chapter 3: Alcohols and Ethers: Not Just for Drinking and Sleeping. Chapter 4: Conjugated Unsaturated Systems. Chapter 5: "Seeing" Molecules: Spectroscopy Revisited. Part II: Discovering Aromatic (And Not So Aromatic) Compounds. Chapter 7: Aromatic Substitution Part I: Attack of the Electrophiles. Chapter 8: Aromatic Substitution Part II: Attack of the Nucleophiles and Other Reactions. Part III: Carbonyls: Good Alcohols Gone Bad. Chapter 10: Aldehydes and Ketones. Chapter 11: Enols and Enolates. Chapter 12: Carboxylic Acids and Their Derivatives. Part IV: Advanced Topics (Every Student's Nightmare). Chapter 13: Amines and Friends. Chapter 14: Metals Muscling In: Organometallics. Chapter 15: More Reactions of Carbonyl Compounds. Chapter 16: Living Large: Biomolecules. Part V: Pulling It All Together. Chapter 17: Overview of Synthesis Strategies. Chapter 18: Roadmaps and Predicting Products. Chapter 19: Ten Surefi re Ways to Fail Organic Chemistry II. Chapter 20: More than Ten Ways to Increase Your Score on an Organic Chemistry Exam.